We know why you’re reluctant to change project management software tools, but Jennifer Bridges, PMP, shows you all the benefits. Of course you’ll want to try this new project management software yourself before making any many changes in the way you do business. That’s important, so you should look for a software tool that allows you a free trial period to get acclimated. Pro-Tip: If you’re ready to make the move, the you should watch Jennifer’s video on the five essential tools you’ll need to manage your project. As a project leader you’re trying to get more done with less, and these tools can help. 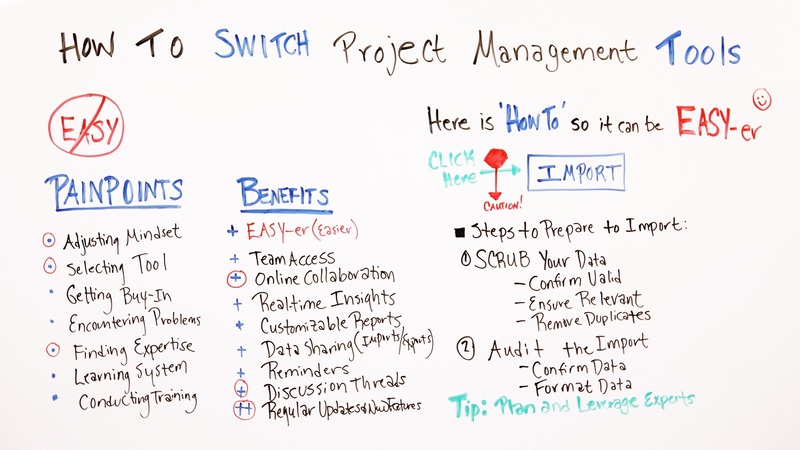 Today we’re talking about how to switch project management tools, and I have to tell you right now this one is near and dear to my heart. So, what I wanna share today are some pain points that I know typically prevents people from making the switch. But I also wanna highlight some of the benefits you gain from switching. But more importantly, I wanna share how you can make it easier. So, first of all calling out some pain points that we all know we meet, is adjusting mindset. We do know how much effort it’s going to take to make the switch and get our team on board. The other one is selecting the tool. Well, the good news today is there’s so many tools available, it actually becomes the bad news, because you have to determine which tool is the right fit for your team. The other one is finding the expertise who can help you make the switch. And then we also know there are the typical pain points involved as well as getting buy-in, encountering problems along the way, and learning the system and conducting the training. But some of the benefits are, number one, the most important to be is it makes it easier. So I really like that, I like to make things easy. The other one is online collaboration. What I love about the new software tools are, it makes online collaboration easier by getting your remote team members on board. They can collaborate, they can give feedback and input, and actually correct things online together. That’s very powerful for a project manager. The other is the discussion threads. You can actually create discussion threads all along the project. You may have one for creating your requirements or create discussion threads for when you’re doing testing. You also, this is powerful I think these days is, when you’re on one of the new software project management tools, there are so many people on the tool and providing feedback for new enhancements or new features, then you get to take advantage of those, because there are regular updates and new features always being implemented. But here’s what I wanna share with you on how to make it easier. I call it the magic button. There’s now an import button, so you can do things as easy as doing an import. So what that means is, there’s a caution though. Before you do it, I wanna share some steps to prepare for the import. So it’s true what they say, data in is data out. So, if you bring bad data in, then that’s gonna be on your new platform going forward. So, you wanna scrub your data first. And so, what does scrub mean? That means you wanna confirm that your data is still valid, you wanna ensure that it’s still relevant to what you’re doing, your projects and your environment going forward, and you also wanna remove the duplicates. Then once the import is done, you wanna audit the import to ensure that what you thought was coming over actually comes over. So, the way that you do that is, you confirm your data is there and then you can take that data and format it to the way you wanna use it going forward. But a tip is to plan. This switch is truly a project as well. So, you wanna plan it, you wanna manage it and track it, and test things before you implement it out to your team. You also wanna leverage experts. Now that you’ve invested in this software tool, it only takes a little bit more to invest in the experts who know the system and know how to get you on it successfully. So if you’re seeking a new project management tool, then visit us at projectmanager.com.